Vinyl records are mechanically produced analog sound storage mediums. The sound and dimensional parameters are based according to the standard IEC 98 publication in its 3rd edition in 1987. In addition to the above mentioned products, there are also different types of records which differ in weight (standard and “heavy”), color, designer labels (picture disc) or shape (shaped vinyl). These may not conform to the standard specifications published in IEC 98. Each side of a record carries a spiral groove with 2 channels (stereo). 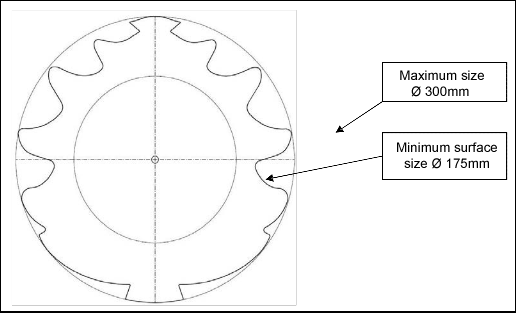 The groove begins at the edge of the record and ends within a specified diameter from the center, where the groove closes within itself. Any request involving a different geometrical groove order needs to be specifically defined as a planned difference from the IEC 98 norm. For a more clear orientation between the track markings, we cut a silent transmission groove (otherwise known as a Visual Track Marker [VTM]) between each track. Keep in mind that these VTMs technically decrease the recordable area of the medium. Before choosing the format of the record, you must take the total playback time and physical principles of playback into consideration. According to this, the worst suitable format is the 7“ EP cut at 33 1/3 RPM (which we don’t recommend, because this format has the lowest circumference speed during playback in the center area of the record). The measurements of vinyl records are based on the IEC 98 norm. Record dimensions 12“, 10“ and 7“ are valid for standard weight vinyl in the diagram below. 1. For 7“ records, the deformation in the recorded area cannot exceed the area of the record with a maximum thickness (2.3mm) on a diameter of 90mm (91.5mm). 2. When placed directly on a flat surface, the warping tolerance at the edge of the vinyl is max. 1.5mm for 12“ and 10“ records. 2. Eccentricity of the spiral groove cannot be more than 0.2mm. Records with a diameter of ∅ 17.5cm (7″) and ∅ 30cm (12″) are manufactured in 2 different weight classes: “standard“ and “heavy“. Records with a diameter of ∅ 25cm (10”) are manufactured in standard weight. All types of records and weights are within ± 10g, apart from ∅ 17.5cm (7″) standard weight, which has a tolerance of ± 7g. Note: Heavyweight vinyl does not provide improved audio quality from standard weight vinyl. That is a hugely common misconception. Heavyweight vinyl may actually deteriorate the acoustic properties of the recording, for example, by causing increased crackling. These degraded acoustic properties cannot be subject to claim. We can also make custom colored vinyl compound, for a price, on orders of 3000pc or more. In this case, it is important to supply a PMS number of the color requested, as well as whether the request is for opaque or transparent vinyl. We will never guarantee a PMS color match, and not all colors and styles can be made, but we will try to accommodate any request, within reason. When combining colors, in any of the styles listed above, please note that each color compound has it’s own properties (density, viscosity, etc.) and therefore react differently when combined with each other – even from batch to batch sometimes – Any photos online, or used as reference, are just a target. There is no guarantee that the colors will not vary at least to some degree. Black, and some other dark opaque colors are VERY dominant when mixed with other colors. Two-color combinations (black w/ transparent splatters) and 2 color configurations (transparent color in black color) are not suitable because the color effect is lost when the transparent color disappears in the black color. Another unsuitable format we cannot make is 7″ heavy vinyl with splatters. Note: Colored vinyl records (Ultra Clear, Opaque Colors and fluorescent pigments especially) may deteriorate the acoustic properties of the recording; for example, most often causing increased surface noise. These degraded acoustic properties cannot be subject to claims. Picture discs are vinyl records which have a printed label on both sides with a sheet of plastic foil (like a transparency) covering the entire surface area on both sides. The grooves are pressed into this transparent plastic material, not vinyl like standard records. As a result, Picture Discs do not sound the same as normal vinyl records, and generally contain increased noise and static. These degraded acoustic properties cannot be subject to claims. One sided picture discs are offered, but uncommon. They are prone to warping/dishing more than other records, and do not comply with the flatness parameters mentioned above. The side without audio still must contain a groove (“silent groove” – groove without an audio signal) to help keep the surface tension necessary for the record to stay as flat as possible. Still, it is important to acknowledge when requesting this product that warping is likely to occur, and this cannot be subject to claims. When printing with a standard raster, images may appear distorted due to a phenomenon known as the moiré effect (interference between the grooves and printed label raster). The intensity of this effect is dependent on the art itself. It is not possible to remove this phenomenon by any technologies implemented by the manufacturer and cannot be subject to claims. Exceeding of the flatness parameters cannot be subject to claim on one sided picture discs. Shaped vinyl are records which are pressed as normal 7”/10″/12” records and then cut into custom geometric shapes afterwards. The shapes are based on vector files submitted by our customers, or using one of our existing shapes. Please note, not all shapes are achievable, and certain shapes with more symmetry work better and yield flatter, more consistent results. Also, most shapes significantly reduce the amount of space left on the record that can contain audio – please discuss the specific shape you want, and the amount of music you want the record to contain with your sales rep prior to placing an order. In the case that a shaped picture disc is requested, the picture disc label must be 2-3mm smaller than the requested final shape size. Shaped picture discs have a tendency to warp/dish, more or less depending on the shapes used. This cannot be avoided, and cannot be subject to claims. Note: A limited recording area results in a limited playback area. Please refer to chapter 1.1. on page 1. Exceeding the flatness parameter on a shaped pic LPs cannot be subject to claim. Test pressings (usually 5-10 copies) can be produced upon request. The difference between test pressings and the full production is that test pressings come with white center labels. Test pressings are sent to the customer for approval and are for approving the acoustic quality of the record only. Claims against other defects will not be accepted. The approved sample is used as a standard for assessing the acoustic quality of the complete production. Limitation of Liability for damages: In the case that a physical master you provide is damaged or lost, our plant will cover the value of the medium, but not the content. Any physical masters provided must be readable throughout the length of the program. In the event that the supplied medium contains read errors which cannot be corrected, processing of the order(s) will be suspended. The customer will be requested to supply a new data. Each master must be clearly identifiable in accordance with the supplied documentation and order (catalog number, customer name, artist, title, etc). The description must also define exactly what is stored on the data carrier (e.g., vinyl master, CD-Audio DDP master or WAV files). If a physical master includes files for more than one title, the files must be stored in separate folders and named according to the catalog number of each title, and must match the information contained in your order forms. We recommend storing the tracks for each side in separate subfolders. Recommendation: ONLY send a COPY of your original master to us for production. It is advisable to send two identical copies clearly marked as a “master” and “back-up”. In the event that any problems occur, we will use the “back-up” copy, thus avoiding potential delays associated with sending new data. Audio files can be added to physical media or uploaded to us. Audio files cannot be used as-is for DMM cutting directly. The data is examined to see if they are suitable for vinyl master cutting, and the tracks will be split between sides of the record and, if necessary, corrective actions will be taken internally to improve the sound quality of your vinyl. We generally do not re-sample files with a sampling frequency higher than 44.1 kHz – only in cases when all files for one side do not have the same sampling frequency. These particular files would be re-sampled in our studio to the highest frequency of all frequencies used. Lower sampling frequencies (for example, 22.05 kHz a 32 kHz), are also accepted but we do not recommend them due to the possibility of degraded sound quality. We recommend sending the files in the same quality as what has been recorded or received from the studio that produced, mastered or mixed the recordings. We recommended to contact the studio in advance regarding recommendations mentioned in this section as well as recommendations for the preparation of vinyl masters mentioned on our plant’s website. We do not recommend any additional conversions or transfers. We recommend storing all of the music for an entire side in one file – forming a continuous and uninterrupted program, including the length of pauses you want on your records. If you do not supply your sides as single tracks, and unless you specifically note otherwise on your tracklisting form, our studio will cut the tracks with the standard 2-3 second gaps between tracks. When we prepare to cut your record, if you sent the master as one track/file per side, we expect that the files contain gaps in between the tracks. We do not add gaps between the tracks in this case. If you request to have specific gaps added, it must be clearly mentioned in the supplied tracklisting. It is possible to request specific gaps depending on each song or the same gap length for all songs. If you supply your sides as one track/file per song, unless you specifically note otherwise on your tracklisting form, our studio will cut the tracks with standard 2-3 second gaps between tracks. If you are concerned about the track spacing on your album, please discuss the issue with your sales rep during the ordering process to ensure your titles are cut the way you desire. Appropriate file naming and file location helps us locate the supplied data quickly as well as enabling a smoother and hassle-free ordering process. • Save all documentation files (tracklist, PQ sheet, studio notes, etc) in this folder. • Create a sub-folder for each side, named “CAT###_SIDE-A”, “CAT###_SIDE-B”, etc. • If the tracks are stored in separate files, name each file by track number and song title, such as 01-Song_name.WAV. Analog or digital mediums containing the continuous recorded information. The division of the program into tracks is defined by the technical conditions of the particular player (ID marks in time sequence) or according to the time mentioned on your order forms. This is the global standard for transmitting data for production of optical disks, as supported by all manufacturers of equipment for mastering CDs and manufacturers of professional workstations for audio processing. Select the setting option for storage of audio tracks in one file if your authoring software supports it,.. Similar to DDP and is transferable to DDP. If your workstation supports both DDP and CMF, select DDP. Files that can be used without any adjustments to burn a CD Audio master. Please refer to 2.1.1. Files which represent a disk image, DDP, CMF or individual audio files containing control elements (e.g. WAV), must be packed in one single file which can also contain documents. Accepted formats of archive files: ZIP, RAR, SIT, 7Z, ARJ, ACE, others on request. Your master must match the tracklisting you provide us on your vinyl order form, unless you are providing a more detailed PQ sheet instead, which also must contain all of the information requested on our tracklisting form. The supplied documentation must be clear and match the supplied data exactly. A track list must accompany all orders including the names and running times of all tracks, as well as which side of the vinyl they should appear on. We also recommend specifying the lengths of the pauses between tracks. Any special requirements (locked grooves, endless loops, lives tracks intended to bleed together, etc) need to be clearly specified and agreed upon in advance. Nearly all of the metal work used in the pressing of our vinyl pressings are produced by us, a vast majority originating from DMM processing done at our plant. On special request, we can cut certain sized lacquers or process lacquer cuts made elsewhere, but both of those options contain inherent risks and additional costs. NOTE: 12″ lacquers for 10″ recording CANNOT be processed. Although we don’t prefer it, we can certainly press using customer supplied materials. We accepts lacquers or nickel metal works called fathers, mothers or stampers. Any supplied production parts must be without any visible damage, cannot be soiled (stains on nickel metal works for example) or showing signs of corrosion. We recommend that all supplied metal work, especially lacquers (which are very sensitive) are packed carefully to avoid any damage during transport to our plant. Stampers have to be supplied as unprocessed, uncut originals – not shaped & beveled. We are not responsible for the quality of records produced from customer supplied materials. Sound defects such as distortion, noise, etc. and defects caused by incorrect cuts (grooves) will not be accepted and all claims rejected. Records are usually labeled on both sides. Center labels on vinyl records are made of a paper material with an especially high clay content, and are a key structural component in the pressing of the vinyl. Our center labels are made from paper with a glossy finish only (140gsm paper for 10″ and 12″ and from 120gsm paper for 7”s). Customers can also choose to produce the records without labels, or with labels only on one side, however this may result in dish warping, as well as deformed, and/or oversized/larger center holes. These potential defects are an inherent risk in making these unconventional products, and cannot be subject to claims. a) For 7“ records (17,5 cm) diameter ∅ 84 mm. b) For 10“ and 12“ records (30 cm a 25 cm) diameter ∅ 100 mm. c) For etched, one-sided records, and other specialty records, we also offer small 25mm center labels that can help protect against warping and deformed/oversize center holes. These can be printed as normal, ordered unprinted (white), or flood black. The text on center labels should be placed so that it does not interfere with the cutting of the labels. We recommend all labels have at least a 2mm gap between the text and the outer edge of the label, and text should not be placed within 10mm of the center of all labels, for all formats (40mm for 7“ labels with big holes). 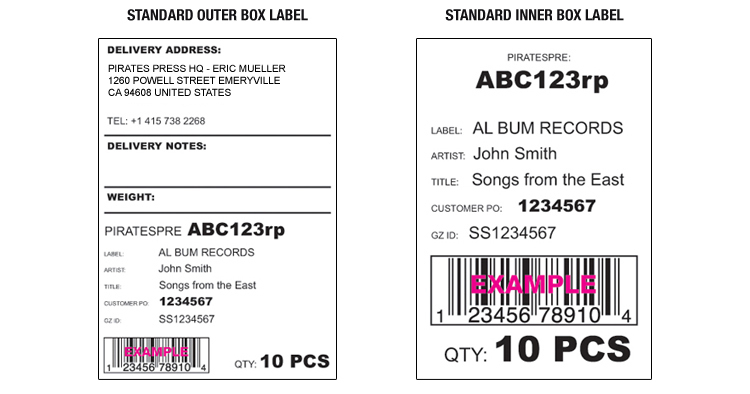 We will make records with customer supplied center labels in special situations ONLY. This must be agreed upon beforehand between a customer and sales rep. Supplied labels must be produced on paper with a weight of 140gsm and printed with colors which are resistant to temperatures of at least 150°C (302°F). The backside of the labels must have lines indicating the direction of the paper grain, and the colors used on supplied labels must not bleed through to the opposite side of the label. Please note: You must supply more sets of labels (10-15% more) than the amount of records you request! We prefer to produce your center labels internally, as we cannot assure the quality of customer supplied labels on the finished product. If you supply labels, and there are any problems during the production of your records, you may be required to supply additional labels, or pay for us to print more. This is an inherent risk of supplying your own labels, and cannot be subject to claims. With the exception of certain special products, all of our vinyl records are shipped inside inner and outer boxes. The box lots (qty per box) are determined by the type of product ordered, and how many will safely fit into the boxes we use. Both inner and outer boxes will be labeled with your catalog number, as well as additional product information as specified on a given order. All information used on the carton labels must be provided at the time of ordering. Any special boxing requirements must also be specified when ordering, and must be specifically noted on the sales order – We cannot make changes to packaging instructions order once it is in production. Making any changes to packaging after a sales order has been confirmed carries with it an inherent risk of error and/or delays; neither of which is subject to claims. • Temperature range from 5°C to 35°C (41°F to 77°F). • Relative air humidity up to 85%, with no harmful chemical fumes. • Records should be stored in a direct upright position and avoid being tilted. • It is the customer’s responsibility to inspect the goods upon receipt of delivery and, if any damage is found (torn or soiled through transport, both of the outer or inner packaging), to inform the delivery driver (if possible) and to inform Pirates Press immediately. All damage claims must be placed within 14 days of delivery. Claims submitted after 14 days will be rejected. We store plates for 3 years at no cost to the customer, in case a repress is desired from the original metalwork. If a customer needs plates to be stored longer than 3 years, they will have the option to pay in advance for additional 6 month periods, at $35 per plate, per 6 month extention. If a title is repressed within three years, the “clock” reverts to zero, and they will be kept on hand for an additional 3 years, at no cost to the customer. Although we have an unbelievably successful track-record of pressing wonderful sounding records, there is always the potential that issues can occur. Whatever the problem, our goal is always the same as yours; to resolve the issue(s) and get your records pressed and out into your customers’ hands as soon as possible. If you’re not happy with your tests, neither are we. Before placing a claim, make sure that multiple people listen to (multiple) test pressings on multiple record players, independent of each others’ critiques. After comparing notes; if there are definite consistencies in your analyses, please proceed with initiating the claims process. This is the only way to isolate these variables as the source of the problem – not isolating them can result in the rejection of your claim, and may cause severe delays to your project unnecessarily. When placing a claim, remember that you are helping us (and our studio) determine if your record should be recut and/or repressed (depending on the issue), and if so, what to focus on when doing so in order to achieve results that you will be happier with. Please be clear and detailed, and we will do our best to use that information to analyze our copy of the tests, as well as the plates, to provide you with a timely, informative, and productive response. Thank you. You can fill out a test pressing claim form HERE.